Marketing process can be a lot like icing a cake. You start with a solid foundation and then add a few layers of icing and maybe even some added toppings. A few years ago there was a commercial that showed a man lovingly bumbling his way through the process of frosting a cake. Every time he’d mess up the cake he’d plop more icing on it and continue to try to smooth it out. He was admittedly quite endearing and even he seemed to find the humor in the process. But make no mistake, more icing did NOT fix the cake. When it comes to marketing, you can’t always plop and smooth icing onto bad processes either. (Else you might end up like this dad in an unrelated but adorable video). Absolutely, there are times where service goes poorly and you need to refund, correct or comp something, but if you find this is happening more and more regularly, it may be time to get under the hood of your processes to see what’s really going on. I hope to be well-known for the fact that because I focus on marketing process improvement I’m always interested in what is not working more so than I am with what is working great. Fixing the broken things in a marketing process provides much more opportunity than polishing things that are already working well. Not too long ago, I was introduced to the client of a client at a meeting here in Dallas. After explaining that I was a marketing strategy consultant, the company representative listed some of the marketing endeavors she was hoping to employ. The longer we talked, the more I understood that their challenges really related much more to employee turnover than to marketing. They were looking for marketing solutions that would keep their employees happy. The employees they’d entrusted to provide care for patients simply didn’t stay long, which caused downstream patient disruption and ultimately loss of business. Throwing marketing money at this wasn’t going bring much resolution. 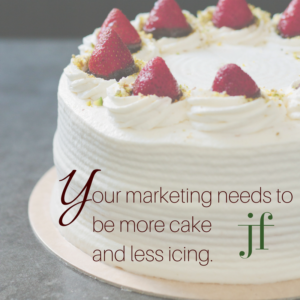 Your marketing needs to be more cake and less icing. Perhaps it was a training problem. In a home health care setting, its easy to understand the challenges in caring for sick and aging people. One of the first things I would look at is if the company is putting the caregivers into a situation they didn’t expect. Maybe the job was more complicated than they expected. Or too emotional. Maybe it was a hiring problem. Most of these people who were hired were being brought in from Craig’s List job listings. Nothing against Craig’s list… okay well maybe something about their job listings. We can likely agree it is likely not the place to find professional and dedicated employees. Paying for a listing on a respected site or a professional recruiter could yield investment returns for years to come. What if it was a payroll problem? The most commonly cited reason for leaving was for higher pay. Maybe a couple extra dollars per hour would encourage people to stay. One of the things I learned very early on in my corporate career was that hiring staff is EXPENSIVE. Hiring the wrong people costs even more. It costs a lot of time to find them, hire them, and train them. If they leave quickly, you have to start all over again. Do this over and over and you’re likely investing thousands of MORE than it would cost to simply increase pay. Concluding, your marketing leaders should be as interested in the cake as they are the icing! Marketing dollars may actually be better spent on process improvement!